A new survey suggests that most Americans are confused about what counts as a healthy food choice. Last year, the US Food and Drug Administration launched a public process to redefine what the word "healthy" means when it’s used on food labels. For a food product to be marketed as healthy, it should have low levels of total and saturated fat, sodium and cholesterol, and have at least 10% of the daily requirements for vitamins, fiber and other nutrients, according to the FDA’s current criteria (PDF). The Dietary Guidelines for Americans recommends that carbohydrates make up 45 to 65 percent of your total daily calories. So, if you get 2,000 calories a day, between 900 and 1,300 calories should be from carbohydrates. That translates to between 225 and 325 grams of carbohydrates a day. The number of fat grams you should eat to lose weight depends on your total calorie intake during your weight loss program. According to the Institute of Medicine, consuming between 20 and 35 percent of your total calories from fat is a healthy amount. The U.S. Department of Health and Human Services reports that safe and effective weight loss diets range from 1,000 to 1,600 calories for women and 1,200 to 1,600 calories per day for men. The American Heart Association recommends no more than 2,300 milligrams (mgs) a day and an ideal limit of no more than 1,500 mg per day for most adults. However,Americans eat more than 3,400 milligrams of sodium each day. Most Americans aren’t. The average adult only eats 15 grams of fiber per day. 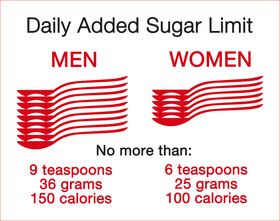 Women need 25 grams of fiber per day, and men need 38 grams per day, according to the Institute of Medicine.